The TCS6JBL Low Voltage Top-up Switch maintains the level of water in a header tank or rainwater break tank by controlling a pump operating at mains voltage and a solenoid operating at 24 volts. The TCS6JBL Low Voltage Top-up Switch maintains the level of water in a header tank or rainwater break tank by controlling a pump operating at mains voltage and a solenoid operating at 24 volts. The level of water in the header tank is monitored by float switches and filled if the level becomes low. 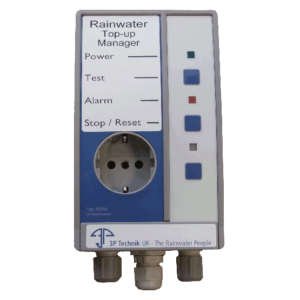 Rainwater is prioritised and fill levels are determined by adjusting the level of float switches. 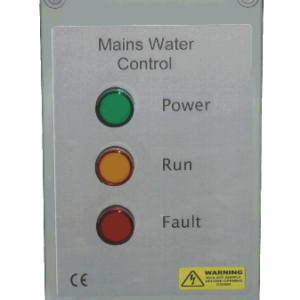 The control panel uses 2 float switches to detect the water level in the header tank and activates the rainwater or mains water-top up accordingly to maintain a sufficient level of water whilst giving priority to rainwater usage when possible. 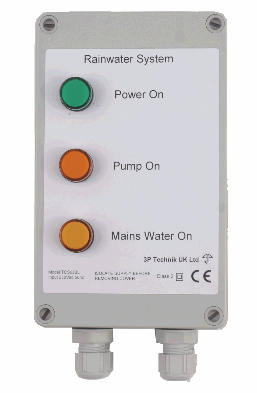 A 230VAC output controls the rainwater pump while mains water top-up is controlled by a 24V DC or AC output (depending on model). The each output will be activated when its float switch reaches a downward angle of approx 45 degrees or more, the top-up cycle will then continue until the float switch reaches an upward angle of approx 45 degrees, thereby ensuring a measured quantity of water is introduced to the tank and avoiding unnecessarily frequent activation. Adjustment of fill volume is achieved by altering the free length of cable attached to the float switches. Front panel indicators indicate the correct function of the 24v power supply (green), and provide activity status of the 230Vac pump output (amber – middle), and of the 24Vdc/24Vac solenoid valve output (amber – lower). Float switch and solenoid circuits are both powered by a safe low-voltage, either 24Vdc (TCS6JBL) or 24Vac (TCS6JBLA) with limited maximum current and over-voltage protection. 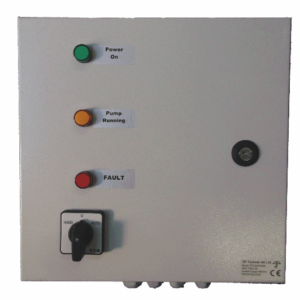 Pump control by a low voltage control circuit rather than direct attachment to the float switch enables longer float switch distances to be achieved without the detrimental effects of voltage drop usually encountered when mains voltages are switched using long float switch cables. 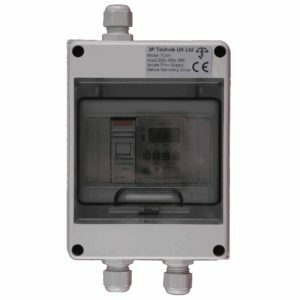 An ingress protection rating of IP66 makes the unit suitable for outdoor installation in sheltered locations.